Hundreds of years before this part of Europe became Germany, cities banded together to create one of the first superpowers. The Hanseatic League, as it was known, dominated trade in the Baltic and North Seas and, for three centuries, grew fat on the profits. All good things come to an end, however, but many of the buildings survive, locked in a medieval time warp. One of the best ways to explore this area is by bicycle – count on at least a week, unless you put your bike on the train between cities. 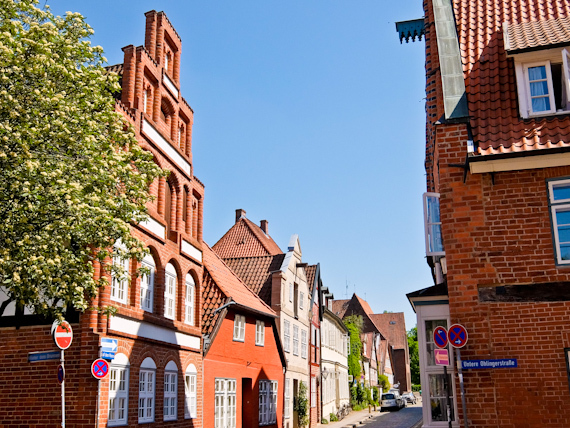 Lübeck and Lüneberg were relatively untouched by WW2 and their narrow streets, lined with fairy tale houses, really do take you back to the middle ages. Unfortunately, Hamburg suffered badly, but its churches have been rebuilt and the new harbour development has its eye firmly on the future. 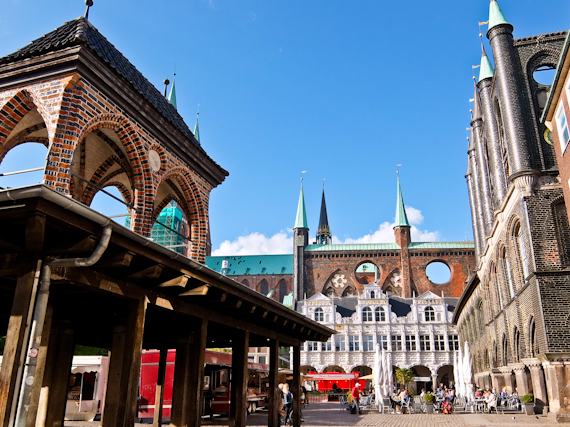 The rebuilding of Lübeck in 1159 is generally acknowledged as the start of the Hanseatic League and the port became the centre of trade in the North and Baltic seas. These days there are still ships in the harbour and, although the city suffered some war damage, the buildings have been painstakingly restored and it retains much of its medieval charm. The city is close to the Baltic so I set out for the coast on a designated cycling trail. To cross the River Trave, I put my bike on a free shuttle bus through the Herren Tunnel. 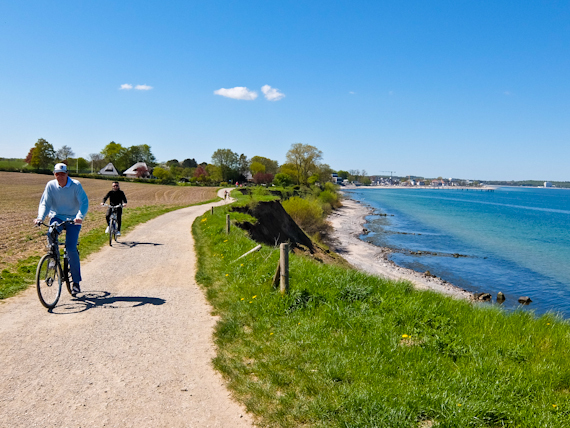 After that, it’s a glorious ride cross country to the port of Travemunde which has ferry connections to Sweden, Finland, Russia, Latvia and Estonia. North along the cliffs is the attractive resort of Niendorf. There’s time for an excellent fish lunch on the seafront at Mein Strandhaus before cycling back through the forest, stopping to sample the first strawberries of the season. 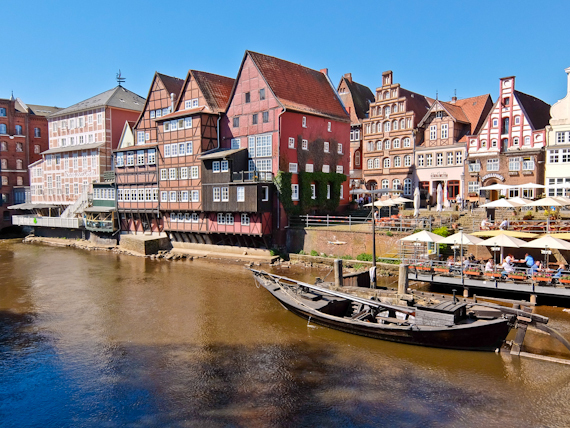 From Lübeck, I cycle south for three hours on a flat stretch of towpath to Hamburg. This was also a Hanseatic city but the medieval town is long gone, first destroyed by fires and then flattened during WW2. Most church spires survived, as they were used as landmarks for allied bombers, and there’s been much reconstruction of other important buildings. The Chilehaus, reminiscent of a ship’s bow, is a shining example of 1920s Brick Expressionism and its ten stories were one of Germany’s first high-rise buildings. Cycling around the city is a joy, although often you share the pavement with pedestrians but the locals don’t seem to object. The famous Reeperbahn is nothing to get excited about, full of inebriated tourists in pursuit of forbidden fun. Nearby, though, are interesting neighbourhoods with cafes, bars and restaurants. 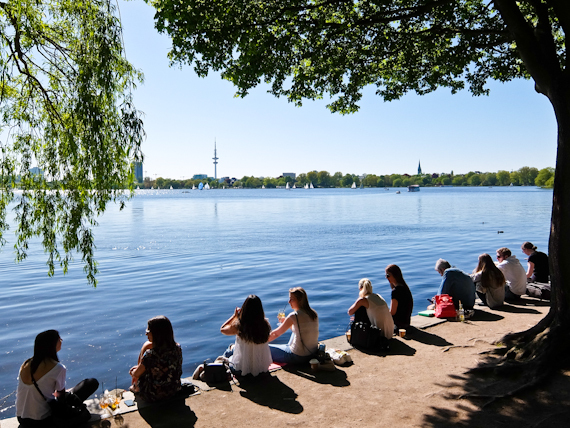 I’m pleasantly surprised by the Alster Lake which sits in the heart of the city, surrounded by a green ring of trees. I do a circuit on my bike, passing through sophisticated residential districts, before taking a cruise to the Alster River. 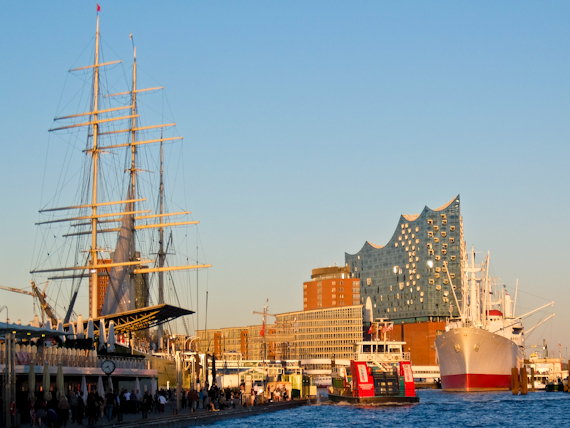 Hamburg’s other river is the Elbe, the city’s main artery, home to the docks and the route for huge cargo ships going to and from the North Sea. There’s a cycle route along its banks and my first stop is the International Maritime Museum housed in one of those UNESCO warehouses. 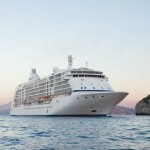 Three thousand years of seafaring history are covered on nine floors with memorabilia, model ships and paintings. Just down river is the fish market, more of a pit stop for night revellers getting their breakfast of beer and herring, to the pounding of cover bands. Continuing above the river I find a good trail to the suburb of Blankenese. Ship owners and merchants built their villas and mansions here in the 18th and 19th centuries and it’s now one of Hamburg’s most affluent neighbourhoods. It tumbles down the banks in a series of winding streets lined with rows of historic houses and chic cafes, perfect for afternoon tea. It meets the river at one of Hamburg’s most beautiful beaches. 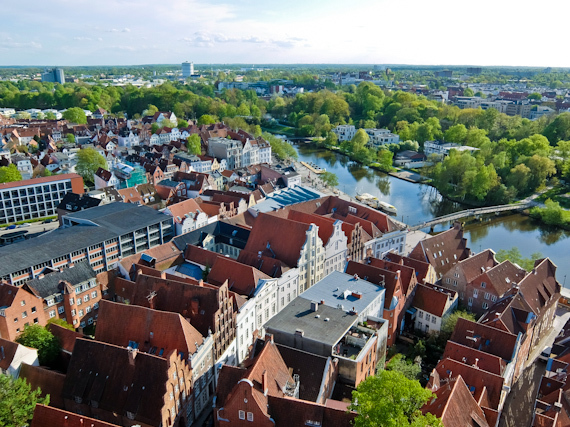 It’s around three hours by bike to Lüneburg, slightly south-east, a city literally built on salt. For 1,000 years, the precious “white gold” was extracted from deposits underground with serious consequences. The mining caused major subsidence, distorting the streets, causing the buildings to lean and curve, and some, of course, have just simply collapsed. 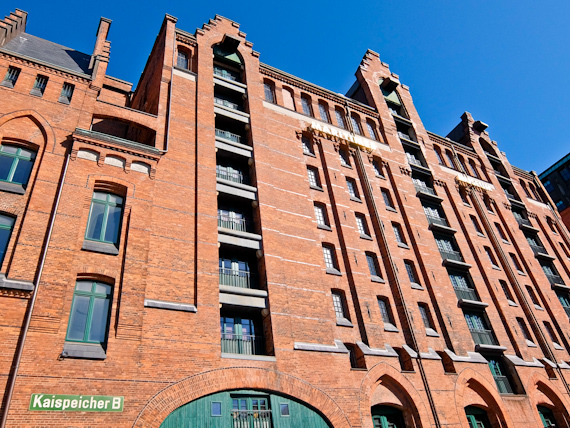 The history of salt can be discovered at the German Salt Museum in the factory where the stuff was processed. 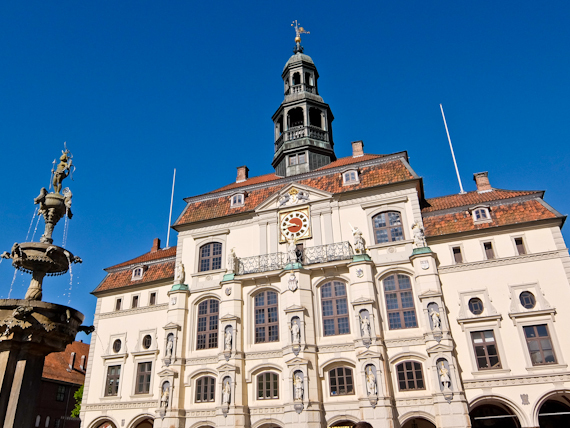 Fortunately, the city was completely spared WW2’s bombs so it’s probably the best preserved of Hanseatic city. I climb to the top of the early 20th century Water Tower and get a view across red-tiled rooftops, pierced by the slightly crooked spires of the three Gothic, churches. Below me is the Ilmenau River, where salt was loaded for transportation, and in the distance is the Kalkberg where the castle once stood. Back in Lüneburg I get a tour of the town hall, really a ragtag assembly of buildings started in 1230 and growing until 1720 when its white baroque facade was constructed. The interior is full of surprises with a main hall lined with Gothic stained glass windows and 16th-century frescoes of the last judgement. Even more impressive is the renaissance council chamber with intricate wood carvings. The oddest item goes right back to the founding of the city. Legend has it that a hunter shot a wild boar when it was taking a bath in a puddle. He skinned it and discovered crystals of salt clinging to the pelt. There’s a bone in a glass case which supposedly comes from this famous boar. It’s hardly surprising that, with all this salt around, the city had over 80 breweries in the 16th century. Even now it has the highest concentration of pubs in Germany and students hang out at the aptly name Wasserviertel or Water Quarter. After a few beers, you might come out thinking the houses have also been drinking – don’t worry, they’ve always been like this. 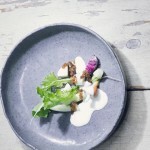 The Schiffergesellschaft serves traditional food in a medieval setting. Hamburg Travel has information about the city.